Abby Martin features an exclusive interview with Hip Hop Legend and Public Enemy front-man, Chuck D, discussing the corporatization of Hip Hop, his views on internationalism and the upcoming United We Stand Festival on May 10th, where both Abby and Chuck are featured guests. In 2012 the police kill a Black man, woman, or child every 36 hours! In July, the Malcolm X Grassroots Movement (MXGM) and the Malcolm X Solidarity Committee (MXSC), issued “Every 36 Hours: Report on the Extrajudicial Killing of 120 Black people”, that documented this tragic and disturbing fact. The report can be found at www.mxgm.org. To reach a broader audience and further inform and educate the public about the findings and implications of this report, MXGM and Nu Afrika Entertainment produced the “Every 36 Hours CD Project”. The CD project features artists Jasiri X, Zayd Malik, Dead Prez, Immortal Technic, Chuck D, Killer Mike, Ife Jai, Truth Universal, Tongo Eisen-Martin and more! The project can be found at www.mxgm.org, http://nuafrikaent.bandcamp.com/, or http://itunes.apple.com/us/album/every-36-hours-black-person/id561144026. “Hip Hop is our biggest and best means of communication with our people and we intend to use it as a weapon to defend ourselves, when in the immediate past, it has been used to destroy our community”, states Zayd Malik, who is a member of the Malcolm X Grassroots Movement Executive Producer of the CD Project. “The Malcolm X grassroots movement has allowed for the opportunity to make this fact a reality in the eyes of our community, and as artists’ we must paint a picture of revolution in an effort to save lives in the face of authoritative figures such as police officers, security guards, and neighborhood watchmen”. 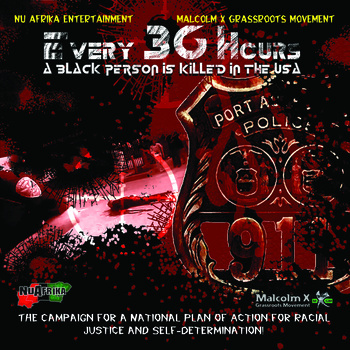 The Every 36 Hours CD Project is a promotional tool for the No More Trayvon Martins Campaign for a National Plan of Action for Racial Justice and Self-Determination that MXGM is advancing. Some of the demands of this campaign include an immediate end to police brutality, the end to racial profiling, the redirecting of resources from the police and military to essential social services, and the institutionalization of local police control boards. Kali Akuno, of the Malcolm X Grassroots Movement states, “These extrajudicial killings must stop. The government has to address the crisis being confronted by Black and Latino people. A national plan of action to address racism and issues like police brutality and murders would be a good place to start”. For more information on the Every 36 Hours CD Project, the No More Trayvon Martins Campaign, or the Malcolm X Grassroots Movement contact MXGM member and project Executive Producer Zayd Malik at zaydmalikmusic@gmail.com. To read the report visit www.mxgm.org. For information on the petition visit http://www.ushrnetwork.org/content/webform/trayvon-martin-petition.